Packed in a wooden gift box. 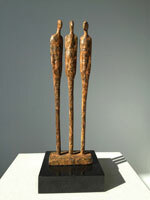 Bronze sculptures - Corporate art for businesses. Edition: 30, this work of art is available. Work of art for any type of business or educational institution. respectful bow is suitable for all business purposes. Sculpture for a board member, manager, professor, actor. 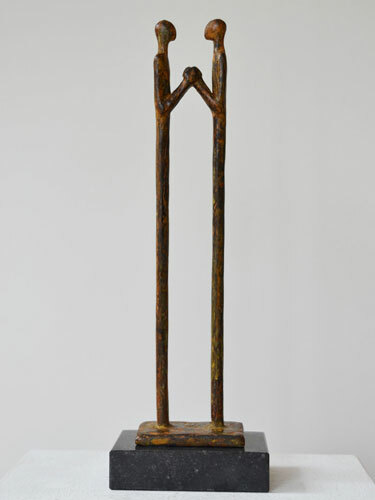 Bronze statuette for an entrepreneur, businessman or company. Edition: AP. 1/1, the piece is available. the one and only artist's copy. This bronze piece is designed for companies, business partners, merger, cooperation or a corporate anniversary. Work of art for an entrepreneur, businessman or company. The sculpture is designed for a collegue, as a goodbye gift. 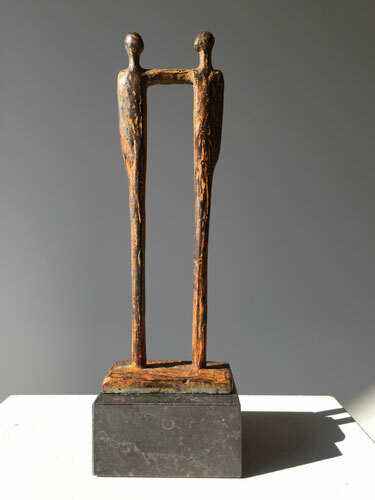 Sculpture for an employee, boss or fellow worker. Work of art for an entrepreneur, businessman or board member. 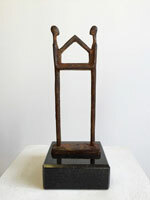 Edition: 8, this corporate sculpture is available. 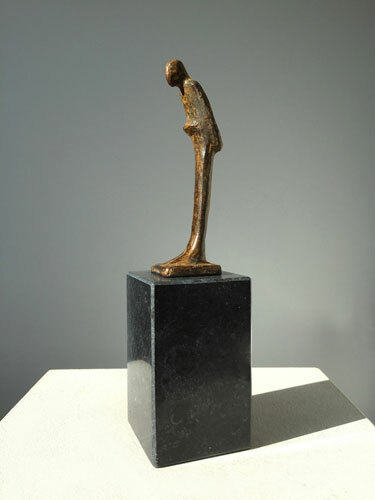 Statuette of a standing figure, proud of what he or she has achieved. Designed for an anniversary or the retirement of a director, president, manager or staff member. Corporate sculpture with multiple human figures, all equal to each other, communicating and looking ahead, that's doing business. Sculpture for a company, University, school or medical institution. Two hands, two companies or business partners, one supports, this solid base is a starting point for the other who can build from there, together they can bring their company to a higher level. 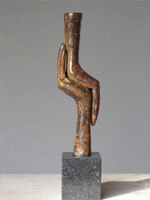 Sculpture for a business transfer. Work of art for a corporate anniversary. Sculpture for the medical sector, hospital, medical institution. Work of art for health care, nursing home, physician, therapist. 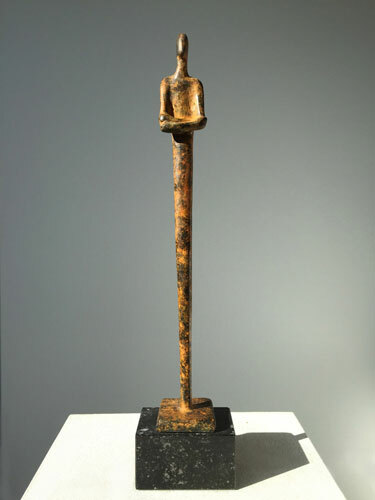 Total height: 3.9 x 6.7 inches. 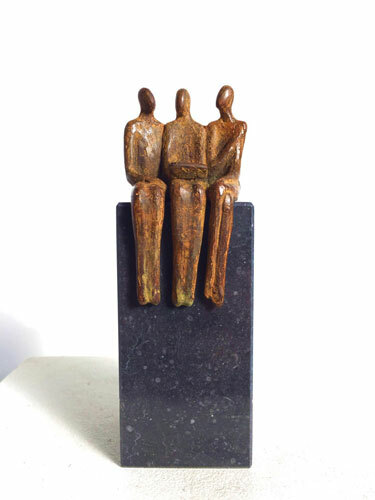 This corporate sculpture is suitable for all companies and businessmen. Bronze sculpture for an entrepreneur, businessman. Work of art for the owner or director of a company. 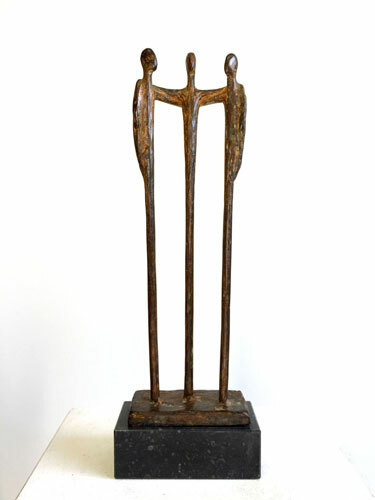 This sculpture is designed for a joint venture, corporate anniversary, merger, for the opening of a new store or company. Work of art for businesses, in case of collaboration. Corporate gift for a new company or headquarters. An expressive work of art, two business partners, equals, grateful that they are doing business together. 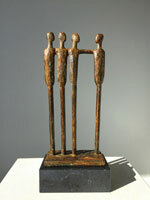 Sculpture as corporate gift for cooperating companies. Bronze sculptures for businesses by sculptor Ragonda IJtsma. These works of art are designed for companies and business purposes such as a corporate anniversary, an award ceremony, or as a farewell gift for a colleague or chief. All works are immediately available, just in case that you need a bronze sculpture for a company on short notice. Corporate art is my passion and doing business is my thing. and I do hope that you are interested in my work! 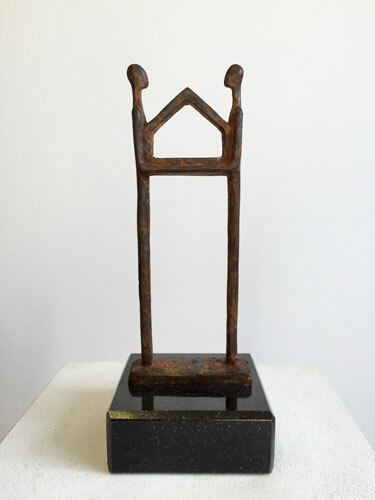 Each sculpture is individually for sale and mounted on a base of Bluestone. Art is pure, beautiful, exclusive and high-end, logical that a luxury tailor-made work of art is so appreciated by everyone. 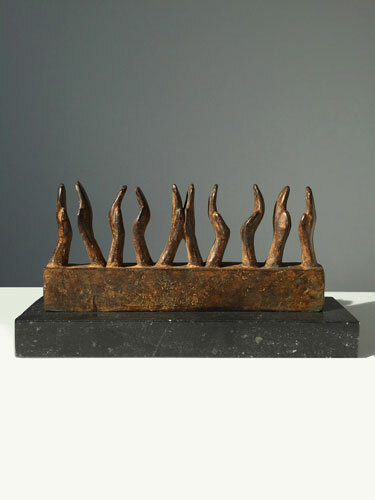 No wonder that a bronze sculpture is the perfect business gift! Send me an email with a few keywords in it and I will create a sculpture for you, your art project could be completed within 2 months. I would love to design a bronze sculpture exclusively for your organisation. When you ask me to make a sculpture for you it's often possible to do this within the available budget. Please read the FAQ for more information. 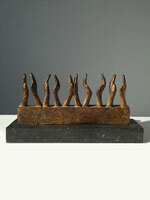 You may always contact me for information about the bronze statuettes on this page or about art assignments.